Ahead of World AIDS Day, which takes place on 1 December, UNAIDS is releasing a series of virtual reality (VR) films focused on HIV testing. Using the latest technology, the films help to demystify HIV testing. With goggles that viewers can wear for a full VR experience, the aim is to reach young people who may want to know their HIV status but are afraid or worried about taking an HIV test. In the films, a group of talented young people re-enact several scenarios of a young woman’s journey to find out her HIV status. Going from her home to a local health clinic, the films allow viewers to explore different settings through a 360-degree experience. Makhulu Media, a South African production company produced the VR films, with guidance from UNAIDS and the support of Google, the Desmond Tutu HIV Foundation and the Children’s Radio Foundation, which were filmed entirely in the township of Nyanga, near Cape Town, South Africa. At the beginning of the project, Makhulu Media organized workshops with young people to discuss their knowledge of HIV, to share their interactions with health-care providers and to describe their experiences while visiting clinics. The next step involved filming non-actors re-enacting scenes between patients and health-care workers. The short films address the fear of a positive test result and HIV-related stigma. 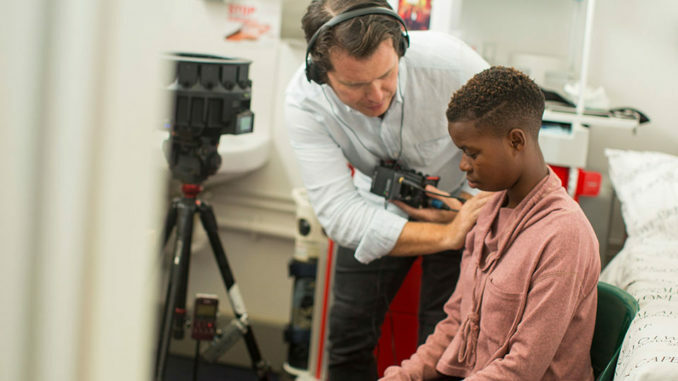 “We wanted to see if immersive virtual reality films could encourage people to take an HIV test and improve relationships between nurses and young people by helping them to step into each other’s shoes,” said Makhulu Media producer Rowan Pybus. The films are being rolled out in clinics, schools and communities in South Africa. Despite progress in reducing AIDS-related deaths and in people accessing treatment, new HIV infections in 2017 in South Africa reached 270 000. This is down from a high of 530 000 in 1998, but the country has 7.2 million people living with HIV—the highest in the world. Google Program Manager Sarah Steele believes that the potential for VT to produce positive social impact is enormous. “360HIV is a powerful example of how virtual reality can help change the attitudes and beliefs that underlie some of the world’s most urgent social and environmental challenges,” she said. A quarter of the 37 million people living with HIV in the world do not know their status. The theme of this year’s World AIDS Day campaign is Live Life Positively—Know Your HIV Status and UNAIDS has prepared a range of communications materials that are now available to download from the UNAIDS website at https://knowyourstatus.unaids.org. All the films and trailers can be found here.